Leeds - Liverpool Canal01274 433678work CanalThe Leeds - Liverpool Canal is the perfect place to take a stroll or cycle. The route takes in some magnificent countryside, industrial heritage and iconic feats of engineering such as the Five Rise Locks. The Leeds and Liverpool Canal main line is 127 miles (204 km) long and crosses the country from Liverpool, Merseyside to Leeds, West Yorkshire. The canal was built with locks 60 ft (18.3 m) long and 14 ft 3 inch (4.3 m) wide to accommodate the Yorkshire Keel barges already in use on the Rivers Aire and Humber. 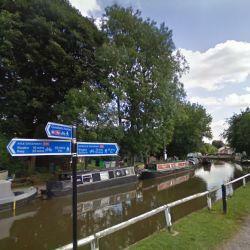 The Leeds and Liverpool Canal is said to be one of the longest single canal in England. The famous Five Rise Locks at Bingley can be found on the canal. The Leeds - Liverpool Canal is the perfect place to take a stroll or cycle. The route takes in some magnificent countryside, industrial heritage and iconic feats of engineering such as the Five Rise Locks.